Chosen as Best of British magazine's November 2017 Book of the Month! You'll be £19.99 closer to your next £10.00 credit when you purchase The History of the Port of London. What's this? The River Thames has been integral to the prosperity of London since Roman times. Explorers sailed away on voyages of discovery to distant lands. Colonies were established and a great empire grew. Funding their ships and cargoes helped make the City of London into the world's leading financial centre. In the 19th century a vast network of docks was created for ever-larger ships, behind high, prison-like walls that kept them secret from all those who did not toil within. Sail made way for steam as goods were dispatched to every corner of the world. In the 19th century London was the world's greatest port city. In the Second World War the Port of London became Hitler's prime target. It paid a heavy price but soon recovered. Yet by the end of the 20th century the docks had been transformed into Docklands, a new financial centre. The History of the Port of London: A Vast Emporium of Nations is the fascinating story of the rise and fall and revival of the commercial river. The only book to tell the whole story and bring it right up to date, it charts the foundation, growth and evolution of the port and explains why for centuries it has been so important to Britain's prosperity. This book will appeal to those interested in London's history, maritime and industrial heritage, the Docklands and East End of London, and the River Thames. A well presented volume of a shipping place of world import. Peter Stone and the publisher are to be congratulated on producing a book, which covers the history of the Port of London from Romans to the present day, in a great amount of detail and for a very reasonable price. Thoroughly recommended to anyone wanting an up to date history of the Port of London in one very accessible, indexed and readable book. Altogether, within the size and nature of the book, it provides a comprehensive account of the history of the port. Fortunately, I have a copy of the Port of London History and Development Notes for Students dating from 1960, which has far better maps and information about the working of the port, so the two complement each other. According to the publicity material, this is the only book that tells the whole story of the history of the port, and whether or not that is correct, it is fair to say that this book adds significantly to the historiography of the subject. An extremely comprehensive volume, complete with maps and black and white photographs. 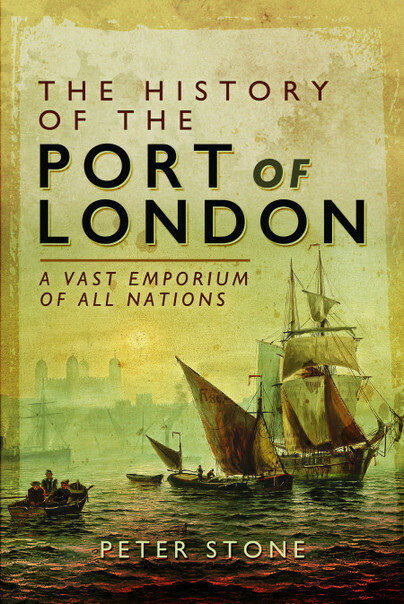 The History of the Port of London is as complete a history of England, world trade, and the port as you could hope for. Mr. Stone traces the various mercantile factors that led to the growth and importance of London as a financial and shipping center and clearly describes how the banks of the Thames were continuously modified to make this all possible. Anyone interested in history, urban planning, civil engineering, the construction trades, economics, or business should take the opportunity to soon read this. Stone's writing is clear and engaging throughout and the accompanying photographs are well chosen. But perhaps what is more impressive is the wide range of writers the author draws upon to bring the port's story to life. This meticulously researched account underlines the importance of the capital's docklands. Details of minor Elizabethan reforms may appeal only to committed maritime historians, yet the overall arc, from Roman landing to modern financial centre, is illuminated by maps, photos and the sheer scale of research. Peter Stone's comprehensive volume helps us all make sense of the changing scene on London's river. Overall, this is a solid, well-researched history, written in an easily accessible style. The full history of the Port of London is finally, and finely, told. The River Thames has been integral to the prosperity of London since Roman times. Explorers sailed away from there on voyages of discovery to distant lands, colonies were established and a great empire grew. Funding their ships and cargoes helped make the City of London into the world’s leading financial centre. And in modern times the area was transformed into Docklands, a new heart of finance. A close-in view of the most famous seaport worldwide, the book will appeal to Londoners and also those outside the capital interested in Britain’s rich maritime heritage. The Thames rapidly became the most important river in the country following the Roman invasion, and has remained so ever since. Peter's History of the Port of London puts everything into perspective and looks at how it developed and changed through the ages. The section on how it became Hitler's prime target during WW2 is especially interesting, along with its conversion to the capital's financial hub, of course. Pure social history of the highest order. At the time of the Great Exhibition of 1851, London was described as being ‘The workshop of the world’. It was, according to the author of this volume, ‘…The [British] Empire’s economic capital… and at the heart of the vast emporium was the Port of London’. This book is that port’s story. To state that this book is comprehensive is to be given to understatement. It is well researched, well-written and quite readable, with the qualification that it is more thesis than light romance. Because of its subject, it is also very wide-ranging in its narrative. When reading it the reader is taken from the Ice Age and the formation of both the British Isles and the River Thames, to the Twenty-first Century (specifically 2017), and the problems attendant to redeveloping a port system which technology and commerce have now passed-by. In the course of this perambulation through time, the reader partakes in the social and maritime histories which moulded and influenced the port and its surrounds, together with the occasional dose of warfare and politics for good measure. The result, as previously noted, is comprehensive and readable. It is also extremely interesting. Peter Stone has given the port of London a fulsome and highly readable biography. A native of the city in which he lives, Peter Stone has for well over a decade studied London's history and during that time written numerous articles for magazines and websites. His family has a long association with the East End of London and his ancestors worked as watermen on the Thames in the 18th century. Peter is a regular commentator about London on social media and is the creator of the popular website www.thehistoryoflondon.co.uk.